We have a Lab card for dentists which makes work more qucik and smooth. there are index for each products. 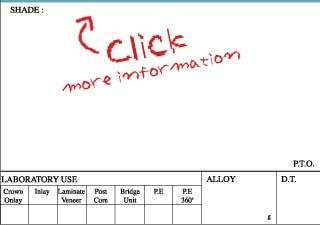 Also it has Special Required space, please write down more information there. this is a colum for dentists to tell the technisians what to do when there is not enough space, by using transfer corping, creat metal occlusion or reducing opposing. It is an acrylic coping the technisian creat which allow us to grind the preparation model with the coping to ideal space. It is a good option when patients have heavy bite or the preparation is very close to opposing. It is an option when some of the oppossing tooth mophology is intetfering the dental restorations space, the technisian will do some minimal reduction. 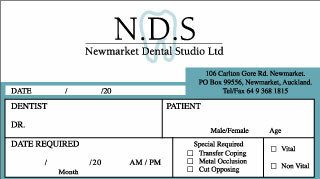 all copyright reserved by Newmarket Dental Studio Ltd.